Dr. Albert Hofmann died today, age 102. He was a pioneer scientist. No doubt he worked with stuff that was dangerous - mainly to the status quo. It seems ludicrous that his research focus became so terribly demonized, while research work merrily continued with napalm, land mines, cluster bombs and depleted uranium. But rather than to link weaponry to Hofmann's work, consider instead a form of complex transport, where incautious operation might be dangerous. Hofmann remembered deeply euphoric moments of when he was a child. Perhaps many of us have such childhood experiences, but they typically fade from memory. Dr. Hofmann's outlook got a jolt on 16 April 1943, when he he was forced to go home early from work at Sandoz Pharmaceutical laboratories; he felt "a remarkable restlessness, combined with a slight dizziness. At home I lay down and sank into a not unpleasant intoxicated-like condition, characterized by an extremely stimulated imagination. In a dreamlike state, with eyes closed (I found the daylight to be unpleasantly glaring), I perceived an uninterrupted stream of fantastic pictures, extraordinary shapes with intense, kaleidoscopic play of colors. After some two hours this condition faded away." He concluded that somehow he'd accidentally absorbed traces of an ergot-derived chemical material he'd been working on, lysergic acid diethylamide. Over the past 65 years there's been great interest in Dr. Hofmann's bicycle trip home. We can now buy posters and pendants commemorating his experience. Most curious! I'd take a memorial bike trip in Dr. Hofmann's memory, but haven't the proper equipment (and I'd likely get into trouble here in Seoul). 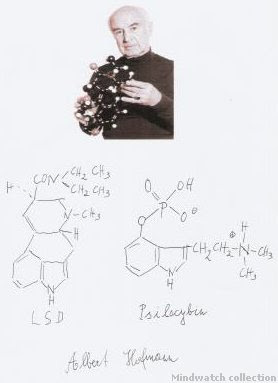 Albert Hofmann later said such experiences changed his life. He'd been surprised: "I had believed there was only one reality, the reality of everyday life. Just one true reality and the rest was imagination and was not real. But ...I entered into realities which were as real and even more real..." An explicit contrast between imagination and multiple realities? Go figure. Anyhow Albert went on to do much other important medical work; but long from now he'll be remembered as an important explorer. Being active to age 102 is quite nice too. RIP.